(Hymenoptera. Belytidae). Entomologist’s Monthly Magazine 91: 114–115. Jervis MA. 1979. Parasitism of Aphelopus species (Hymenoptera: Dryinidae) by Ismarus dorsiger (Curtis) (Hymenoptera: Diapriidae). Entomologist’s Gazette 30: 127–129. Kozlov MA. 1971. Proctotrupoids (Hymenoptera, Proctotrupoidea) of the USSR. 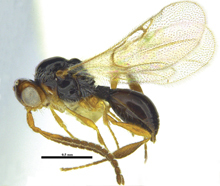 Trudy Vsesoyuznogo Entomologicheskogo Obshchestva 54: 3–67. Masner, L. 1976. A revision of the Ismaridae of the New World (Hymenoptera, Proctotrupoidea, Diapriidae). The Canadian Entomologist 108: 1243-1266. doi:10.4039/Ent1081243-11. Masner, L. 1993. Superfamily Proctotrupoidea (pp. 537-557). In GOULET, H. & HUBER, J. (eds). Hymenoptera of the World: an identification guide to families. Research Branch, Agriculture Canada, Ottawa, Canada, 668 pp. for the Identification of British Insects 8(3dii): 1–107. Olmi M. 2000. Bio-ecologia degli Imenotteri Driinidi e loro impiego in programmi di lotta biologica. In: Lucchi A (Ed.) La Metcalfa negli ecosistemi italiani. ARSIA, Firenze, 93–117. Tussac H, Tussac M. 1991. Récapitulatif d’une collecte de Dryinidae et Diapriidae (Hym. Chrysidoidea et Proctotrypoidea). Entomologiste 47(4): 189–194. Photographs © Chang-Jun Kim (Korea National Arboretum) or © Robert Copeland (ICIPE).